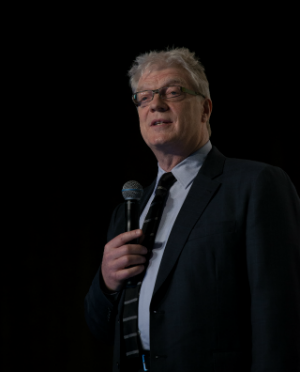 Like most teenagers, Sir Ken Robinson had no idea what he wanted to be when he grew up. "Life is a constant improvisation. How many of you, at the age of 15, accurately anticipated the life you've had?," he asked at his ASCD Annual Conference general session presentation last month. "Your résumé conveys the myth that this was all planned. The last thing you want to do is convey the actual chaos you've been living through." The path through your life appears as you take it, he explained, and finding your element implies tuning your ear to that inner voice that guides you along the journey. "It requires looking both beyond yourself and more deeply inside yourself to plot a course through your own talents and interests," Robinson noted. "What do we want our children to be like? Think of that child, that teenager, that young adult and describe them. What words do we use? ... What do our children want to be like when they are 25? How would they describe themselves? Are they content with an education system which at times seems more designed to sort, test, and label students than develop, educate, or prepare them?" We live in a global economy that requires our students to be prepared to think both critically and creatively, evaluate massive amounts of information, solve complex problems, and communicate well. A strong foundation in reading, writing, math, and other core subjects is still as important as ever, yet by itself is insufficient for lifelong success. For too long, we have committed to time structures, coursework, instructional methods, and assessments designed more than a century ago. Our current definition of student success is too narrow. It is time to put students first, align resources to students’ multiple needs, and advocate for a more balanced approach. The long-term benefits of the Common Core State Standards (CCSS) and Next Generation Science Standards (NGSS) have been touted by the academic community at large, yet it's often difficult to envision the light at the end of the tunnel when dealing with the demands and challenges of actual classroom implementation. Although these standards make it clear what is expected of students, many teachers are left without a road map explaining how to approach and properly convey this new material in the classroom. What Do You Think We Need from Education? As we continue our discussions on "Choosing Your Tomorrow Today" and "The Future of Schooling" as part of ASCD's Whole Child Symposium, let's add another question to ponder: What do you think we need from education? An independent school leader and public school parent, Chris Thinnes (@CurtisCFEE) is the head of the Upper Elementary School and academic dean at the Curtis School in Los Angeles, Calif., and founding director of its Center for the Future of Elementary Education. He is a member of the National Association of Independent Schools' advisory council on diversity, a member of the EdCamp Foundation's public relations committee, and a fellow of the Martin Institute for Teaching Excellence. Originally shared on his blog, these are Thinnes' remarks from the Whole Child Symposium Town Hall at the 2014 ASCD Annual Conference, inspiration from the Network for Public Education Conference, and reflections on an EdLeader21 PLC Advisory Group meeting. "Sisters and brothers: Don't settle for the 'okey-doke'..."
"We don't support the status quo..."
I just returned to Los Angeles after the honor of participating in one of the great conversations about the future of education, sitting around a table of district leaders engaged in writing what some have called a "third narrative" of public education in the United States. For days we collaborated in an effort to generate a theory of action, and made concrete commitments to a series of initiatives, that will have an impact on the experience of 2 million children in EdLeader21 member schools and districts in the coming years. ASCD's 2014 Legislative Agenda urges a shift from the overreliance on high-stakes testing in determining student achievement, educator effectiveness, and school quality to a broader, more meaningful vision of success that supports each student from early childhood through graduation. Recently released during ASCD's Leadership Institute for Legislative Advocacy (LILA), the agenda is developed by ASCD's Legislative Committee and establishes the association’s policy priorities. ED Pulse Poll Results: Will a Longer School Day and Year Better Prepare Students for Success? ASCD continually seeks to provide solutions to the challenges that face educators of all levels. A recent ASCD SmartBrief ED Pulse poll asked readers if instituting a longer school day and year will better prepare students for success in college and the workforce. With so much attention being paid to college and career readiness, the importance of early childhood education should not be overlooked. In the new issue of Policy Priorities, ASCD explores the significance of early childhood education and details the challenges of expanding access and ensuring equitable services for all children. The brief also provides updates on how educators and policymakers are working to improve the quality of early education through standards implementation, rigorous licensing, new accountability, and greater alignment with K–12 systems, all while recognizing the importance of developmentally appropriate strategies. Read the full issue. Along with my schedule of social studies classes, I also serve as an advisor for 15 students once a week. Through advisory I spend time looking at their grades, checking in with their lives, and mostly building relationships that are often lost between teachers and students in high school. While I love the chance to have such a close relationship with a handful of students, it seems like a week does not go by without one or more of them asking me about why they have to study this subject or another. "Why do I need to take Calculus?" or "Why do I need biology when I am not going to be a biologist?" For a long time, I would simply tell them that learning math, science, English, and history were all part of what made them well-rounded students, able to succeed in college and beyond. Recently, I came to a different conclusion. In the past year, experts and practitioners in the field, whole child partners, and ASCD staff have shared their stories, ideas, and resources to help you ensure that each child, in each school, in each community is healthy, safe, engaged, supported, and challenged and prepared for success in higher education, employment, and civic life.